The 14th Amendment of the US Constitution, and a 1952 act of Congress, say that people born in the US and subject to its jurisdiction are citizens. 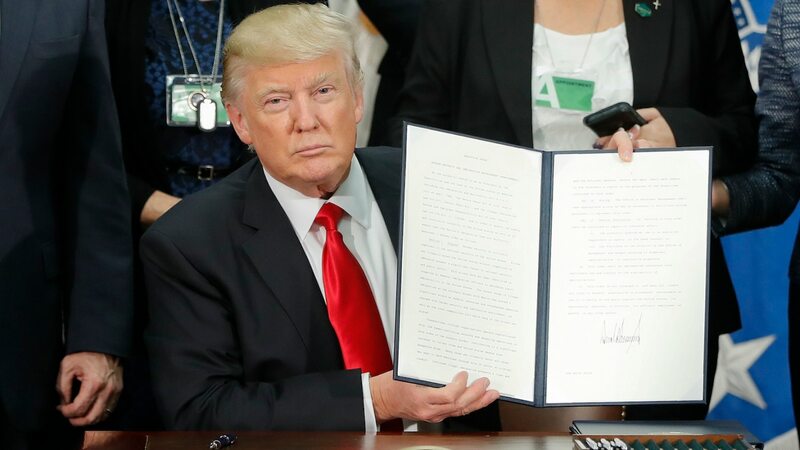 President Donald Trump plans to use an executive order to end birthright citizenship. The practice extends citizenship to children born in the US, even if their parents are unauthorized immigrants. The 14th Amendment and the Immigration and Naturalization Act of 1952, both ratified by Congress, state that people born in the US and subject to its jurisdiction are citizens at birth. Trump could argue that children of unauthorized immigrants aren&apos;t subject to US jurisdiction. Trump campaigned on cutting down on immigration and what he calls "anchor babies," a term his opponents have deemed "vile" or racist. President Donald Trump plans to use an executive order to end birthright citizenship, a practice that extends citizenship to children born in the US, even if they&apos;re born of unauthorized immigrants. In an interview with Axios published on Tuesday morning, Trump called the practice of giving citizenship to all children born in the US "ridiculous" and announced his plans to sign an executive order banning it. But Trump&apos;s executive orders on immigration have been met with heavy legal challenges before, and the US constitution states: "All persons born or naturalized in the United States, and subject to the jurisdiction thereof, are citizens of the United States." Further, the Immigration and Naturalization Act (INA) of 1952, the basic body of US immigration law, also says that a "person born in the United States who is subject to the jurisdiction of the United States is a U.S. citizen at birth." Trump&apos;s potential legal argument for overriding the common interpretation of the 14th Amendment and the INA, both ratified by Congress, amounts to challenging whether or not unauthorized immigrants to the US are "subject to the jurisdiction" of the US. Both the 14th Amendment and the INA include this clause. Are "anchor babies" a serious concern? Children born to unauthorized immigrants in the US under the current interpretation of immigration law gain access to US benefits. The children, as citizens, can then sponsor their families to become US citizens as well once they turn 21. But for a child born of unauthorized immigrant parents in the US, sponsoring families presents serious challenges. For example, the parents who entered the US illegally would have to return to their native country for 10 years before they can return and be legalized. 3.8 million undocumented immigrants in the US have at least one child who is a US citizen, Business Insider reported in 2015. The Center for Immigration Studies, which favors lower immigration to the US, credits "297,000 births per year to illegal immigrants" in 2015. The Pew Research Center put that figure at 340,000 in 2010, but says the number has declined since. Trump campaigned on lowering immigration, and wants to target what he called "anchor babies," or children born to unauthorized immigrants who help the parents establish citizenship. While Democrats often seize upon the term as racist or xenophobic, federal authorities have taken the practice seriously and amped up enforcement against a multimillion-dollar, so-called "birth tourism" business.